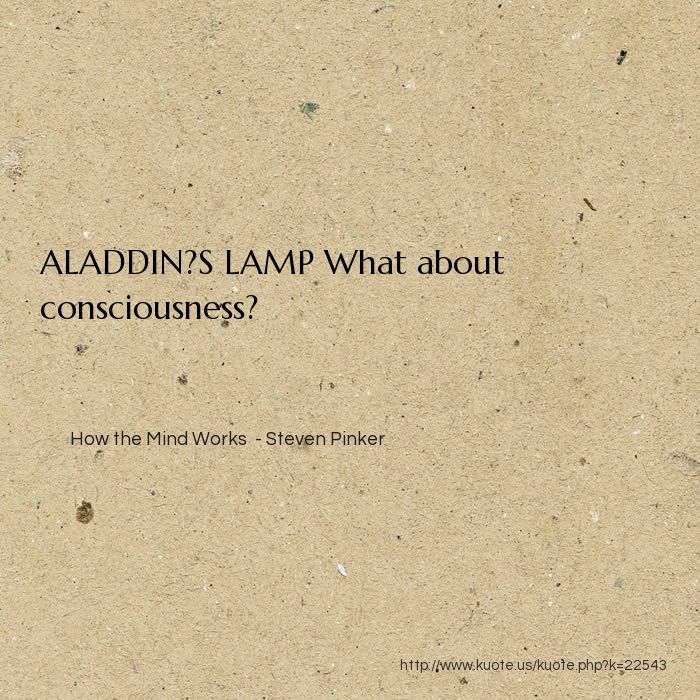 ALADDIN?S LAMP What about consciousness? 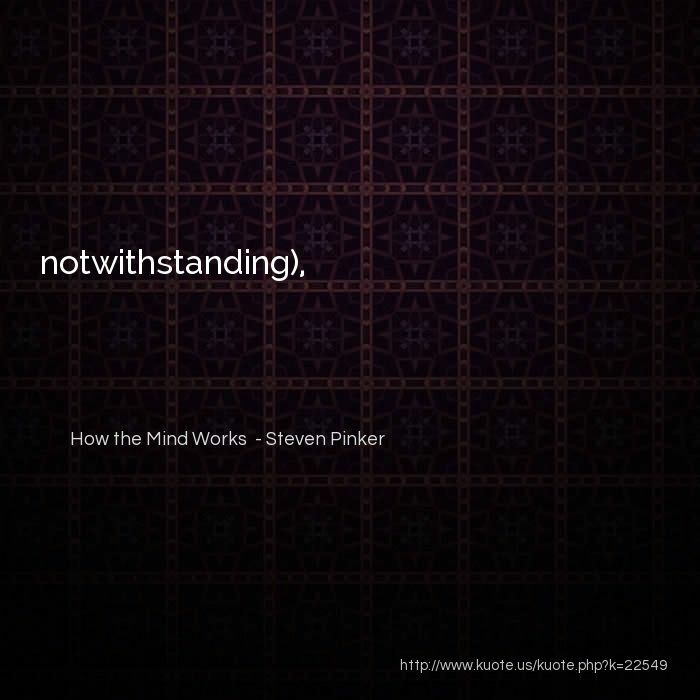 The other view?which I favor?is that those neural networks alone cannot do the job. 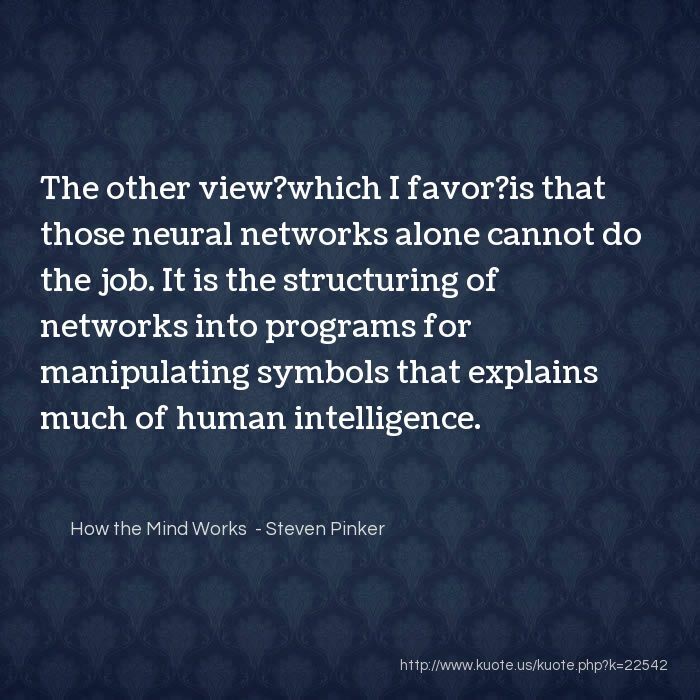 It is the structuring of networks into programs for manipulating symbols that explains much of human intelligence. Why do we pursue the trivial and futile and experience them as sublime? 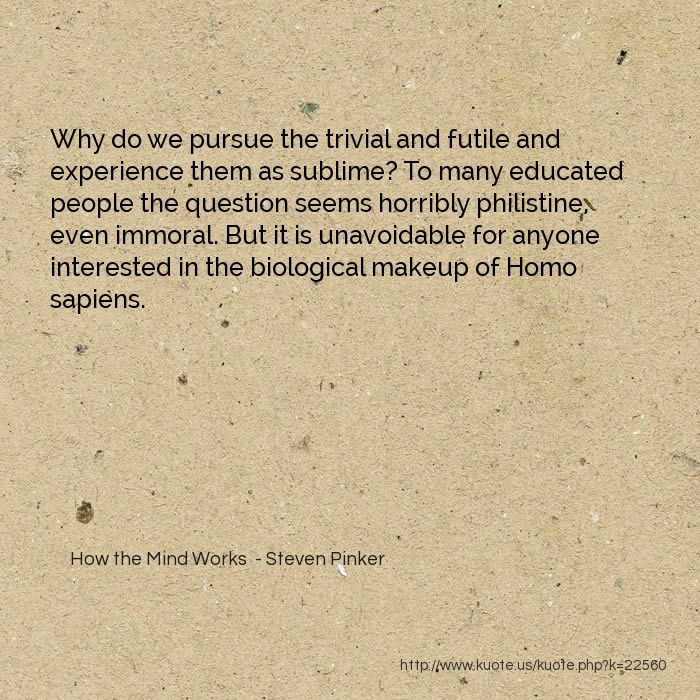 To many educated people the question seems horribly philistine, even immoral. But it is unavoidable for anyone interested in the biological makeup of Homo sapiens. 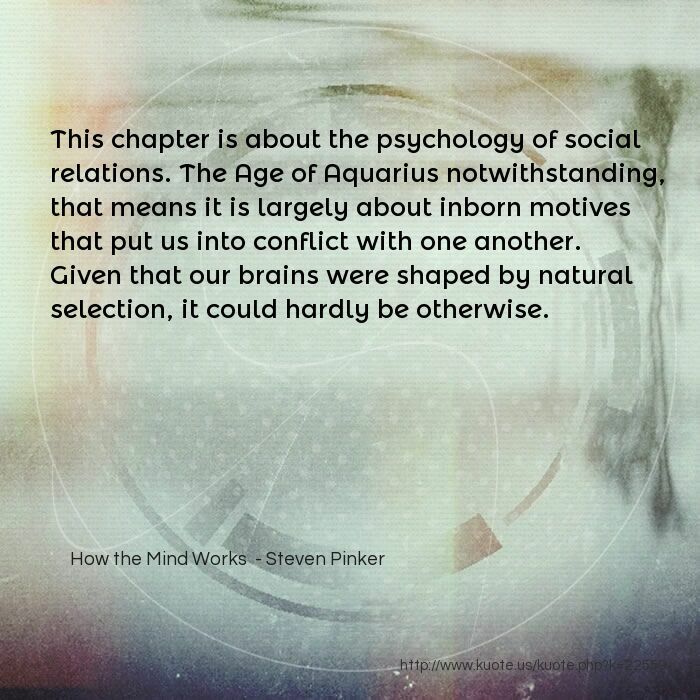 This chapter is about the psychology of social relations. The Age of Aquarius notwithstanding, that means it is largely about inborn motives that put us into conflict with one another. 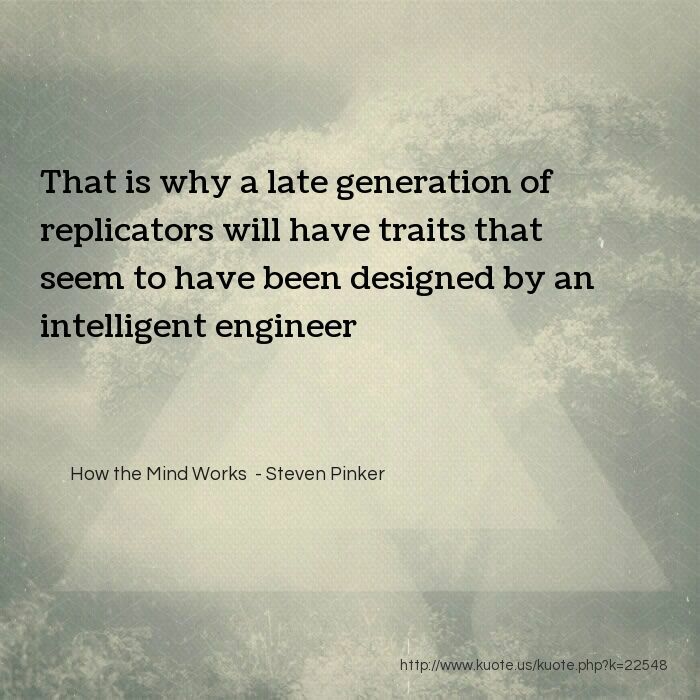 Given that our brains were shaped by natural selection, it could hardly be otherwise. 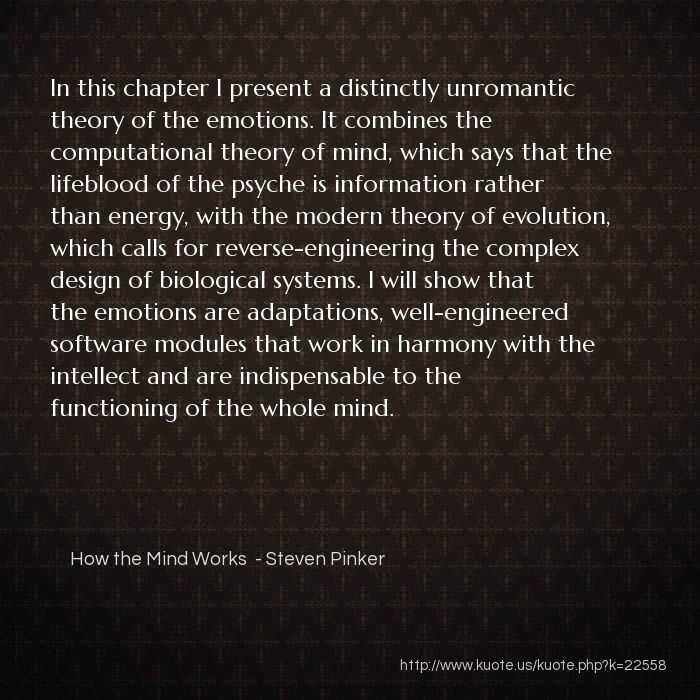 In this chapter I present a distinctly unromantic theory of the emotions. 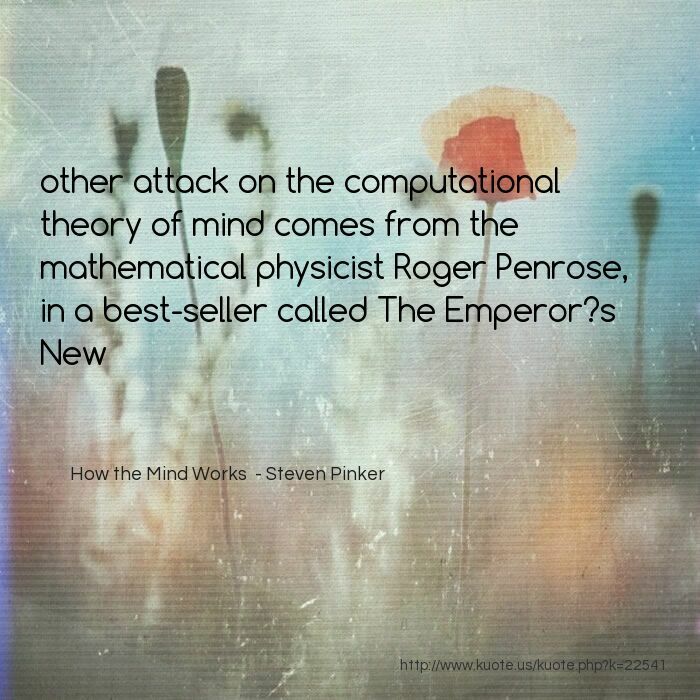 It combines the computational theory of mind, which says that the lifeblood of the psyche is information rather than energy, with the modern theory of evolution, which calls for reverse-engineering the complex design of biological systems. 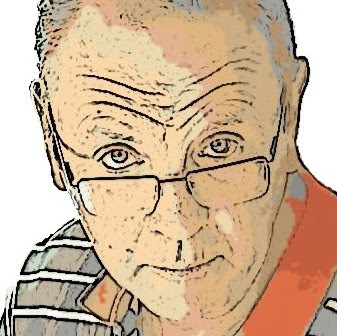 I will show that the emotions are adaptations, well-engineered software modules that work in harmony with the intellect and are indispensable to the functioning of the whole mind. 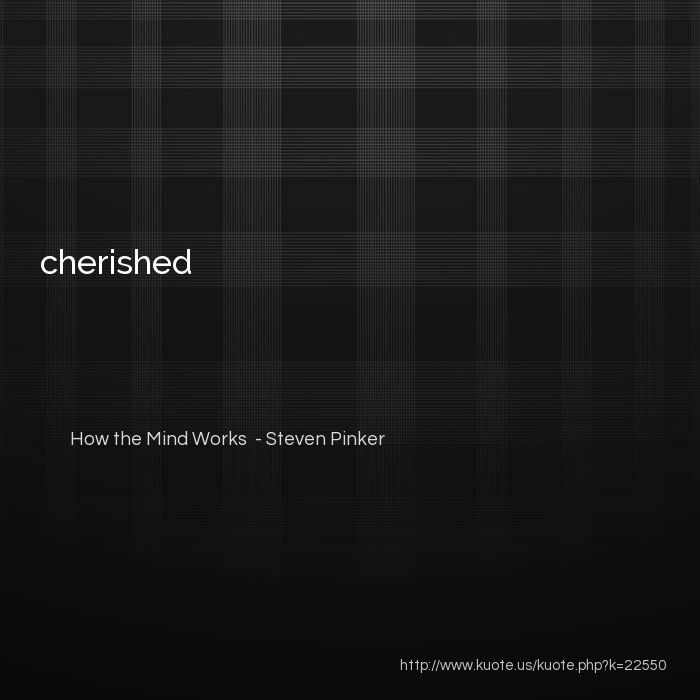 This chapter is about human reasoning: how people make sense of their world. 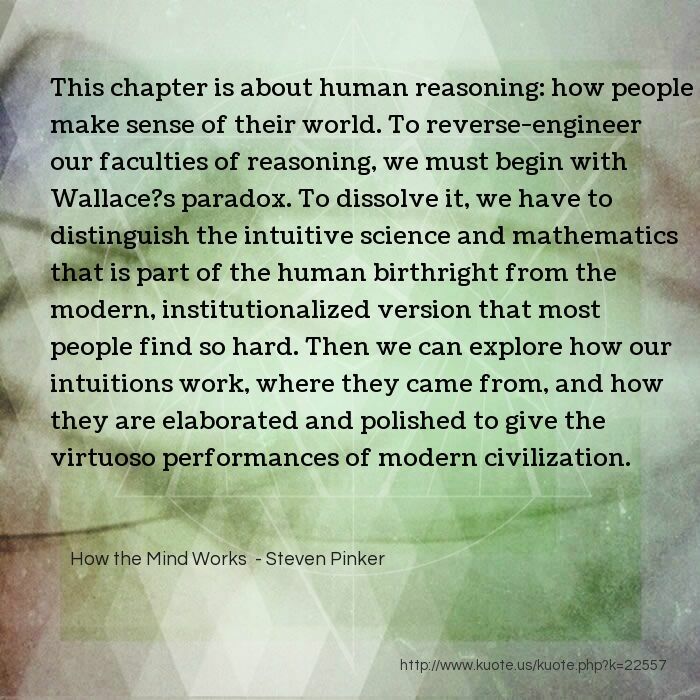 To reverse-engineer our faculties of reasoning, we must begin with Wallace?s paradox. To dissolve it, we have to distinguish the intuitive science and mathematics that is part of the human birthright from the modern, institutionalized version that most people find so hard. 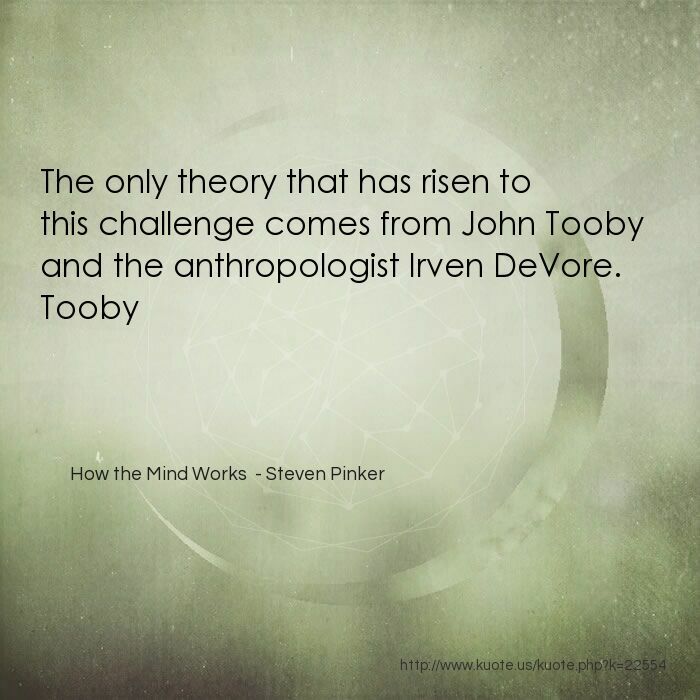 Then we can explore how our intuitions work, where they came from, and how they are elaborated and polished to give the virtuoso performances of modern civilization. 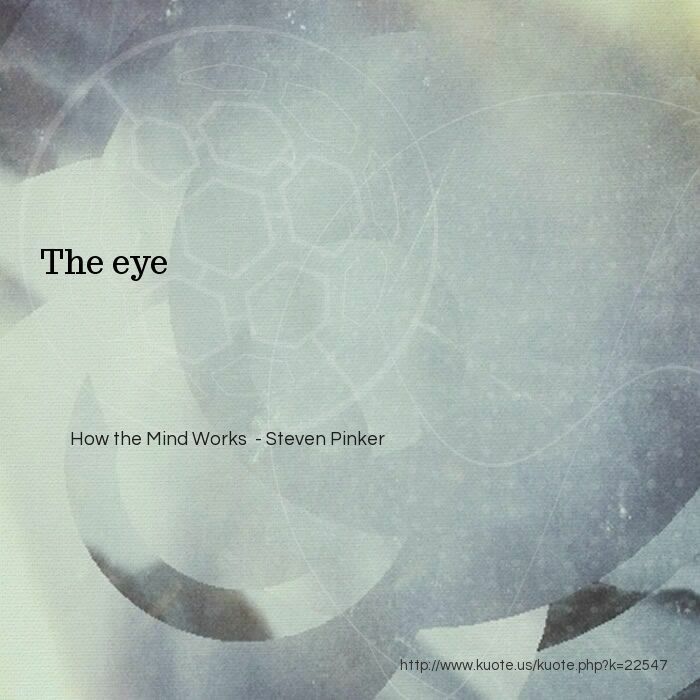 This chapter explores how vision turns retinal depictions into mental descriptions. 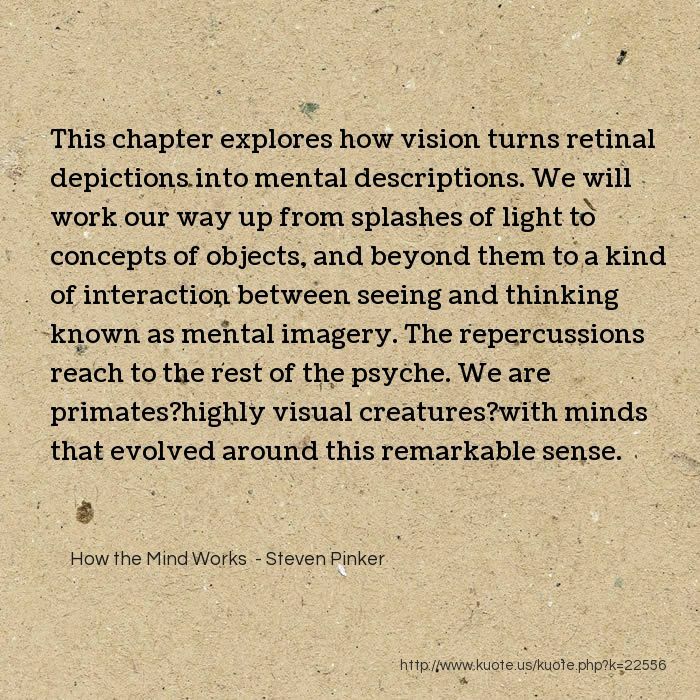 We will work our way up from splashes of light to concepts of objects, and beyond them to a kind of interaction between seeing and thinking known as mental imagery. The repercussions reach to the rest of the psyche. 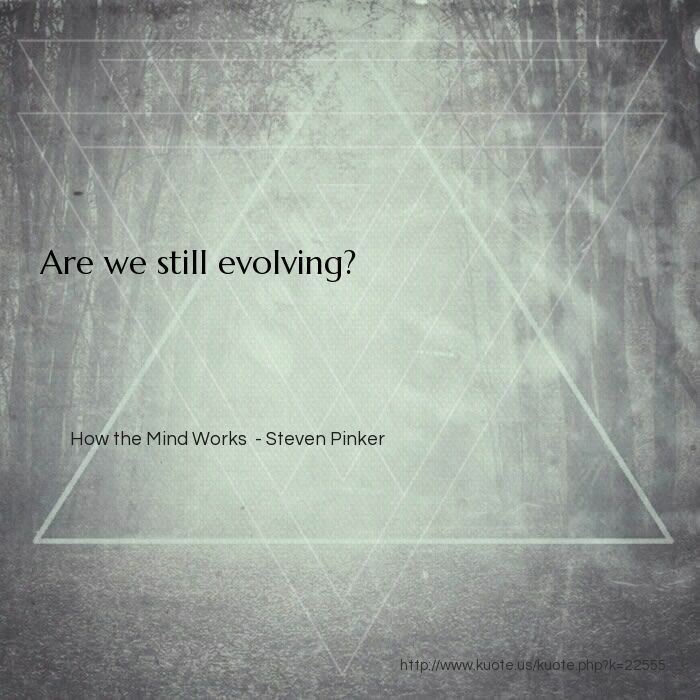 We are primates?highly visual creatures?with minds that evolved around this remarkable sense. 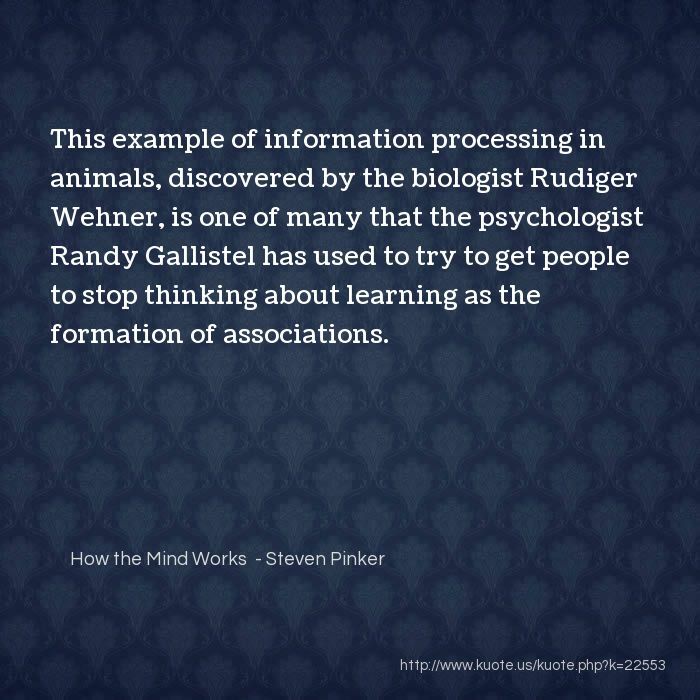 This example of information processing in animals, discovered by the biologist Rudiger Wehner, is one of many that the psychologist Randy Gallistel has used to try to get people to stop thinking about learning as the formation of associations. 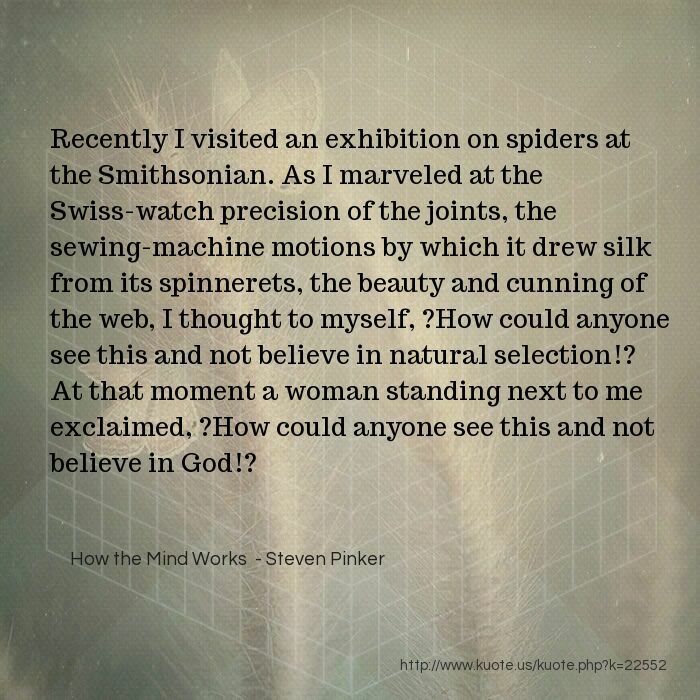 Recently I visited an exhibition on spiders at the Smithsonian. As I marveled at the Swiss-watch precision of the joints, the sewing-machine motions by which it drew silk from its spinnerets, the beauty and cunning of the web, I thought to myself, ?How could anyone see this and not believe in natural selection!? At that moment a woman standing next to me exclaimed, ?How could anyone see this and not believe in God!? 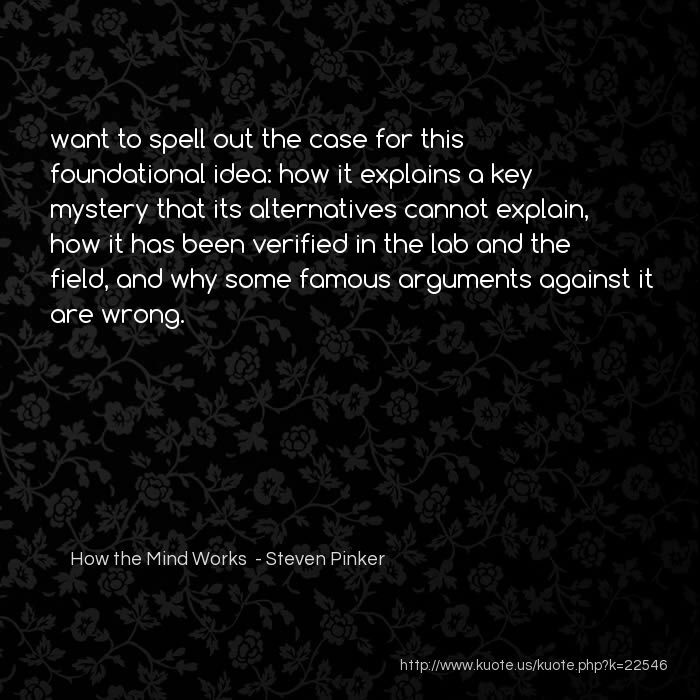 want to spell out the case for this foundational idea: how it explains a key mystery that its alternatives cannot explain, how it has been verified in the lab and the field, and why some famous arguments against it are wrong. 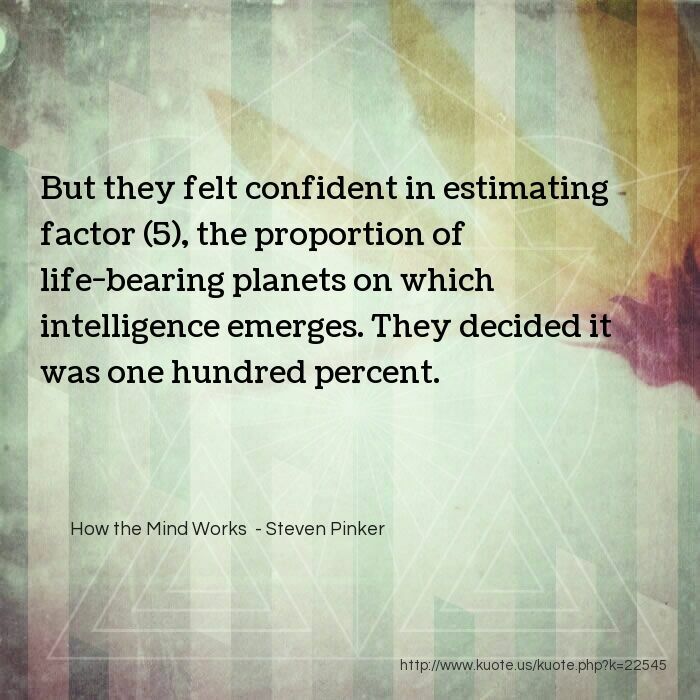 But they felt confident in estimating factor (5), the proportion of life-bearing planets on which intelligence emerges. They decided it was one hundred percent. 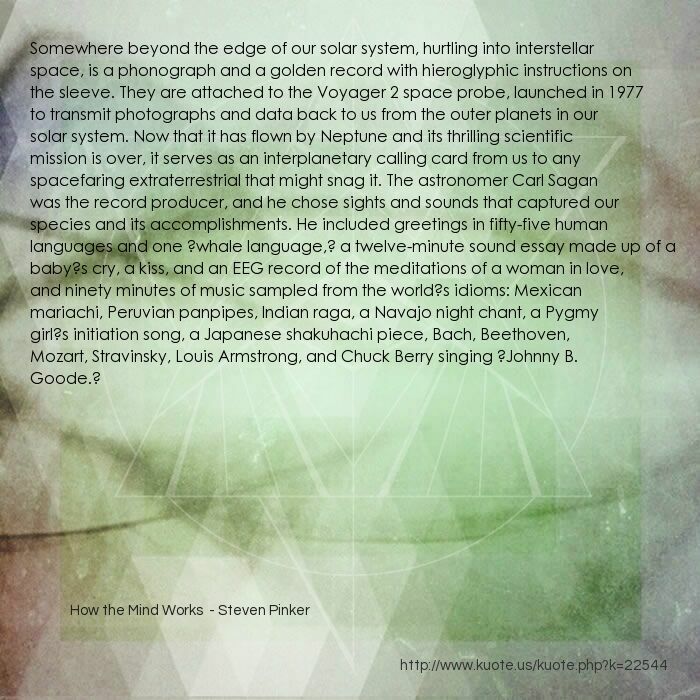 Somewhere beyond the edge of our solar system, hurtling into interstellar space, is a phonograph and a golden record with hieroglyphic instructions on the sleeve. They are attached to the Voyager 2 space probe, launched in 1977 to transmit photographs and data back to us from the outer planets in our solar system. Now that it has flown by Neptune and its thrilling scientific mission is over, it serves as an interplanetary calling card from us to any spacefaring extraterrestrial that might snag it. The astronomer Carl Sagan was the record producer, and he chose sights and sounds that captured our species and its accomplishments. He included greetings in fifty-five human languages and one ?whale language,? a twelve-minute sound essay made up of a baby?s cry, a kiss, and an EEG record of the meditations of a woman in love, and ninety minutes of music sampled from the world?s idioms: Mexican mariachi, Peruvian panpipes, Indian raga, a Navajo night chant, a Pygmy girl?s initiation song, a Japanese shakuhachi piece, Bach, Beethoven, Mozart, Stravinsky, Louis Armstrong, and Chuck Berry singing ?Johnny B. Goode. ?